A famous poet once said: “Immature poets imitate; mature poets steal”. What’s not often mentioned is the continuation of that quote which adds: “bad poets deface what they take, and good poets make it into something better”. Everything we create is influenced by what went before, and web design is no exception. Good web designers draw inspiration from the work of others, bad designers repeat blindly without understanding the process that shaped what they are looking at. But sometimes I don’t feel like delving into HTML and CSS, and sometimes the information I want isn’t easily discovered from a quick perusal of the source. When I spot a typeface that impresses me, or a layout that I like, I reach for the small collection of tools that live in my browser toolbar waiting for just such a moment. 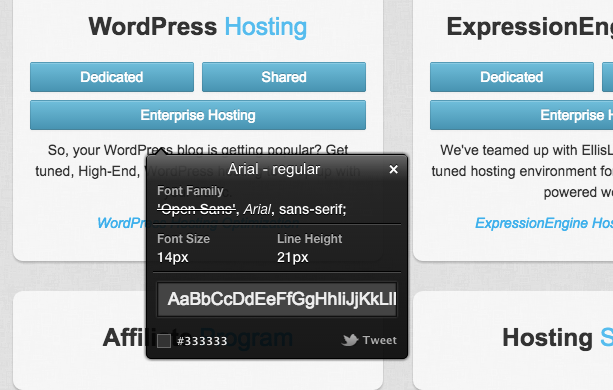 As the name suggests, WhatFont identifies fonts, and it does an excellent job of it. It will identify the font in use, its size, color, and the line spacing, and, quite usefully, it will frequently tell you the webfont service that a site is using, where there is usually much more information available. WhatFont is available for Google Chrome and Safari, and as a bookmarklet for other browsers. Horrible name, useful tool. AppSpector examines the code of a site and tries to work out which technology it’s using. It can identify hundreds of different application and scripts. If you used it on this blog, you’d see that we’re using WordPress 4.0, Disqus, Bootstrap and some others, and that the whole thing is running on Apache. AppSpector is available for Google Chrome. Once I know a site is running WordPress, I usually want to find out which theme and plugins it’s using. For that I use a site rather than a plugin: What WordPress Theme Is That is quite good—although not infallible. It’ll take a good guess at identifying a theme and does a fairly good job at spotting plugins, although you won’t get a comprehensive list because some plugins don’t make their presence known (We use a custom theme on this blog, so the site doesn’t know about it). If this collection fails me, then I’ve no choice but to delve into the excellent Google Chrome Developer Tools, or the equally good Safari tools.